Deborah went up first and said, “Ciao guys! !” They were very surprised to see her and recognized her right away!! Ignazio gave her a big hug and smile and Gianluca a big smile and said to her, “Come stai?” She drew a blank and almost said “Bueno”!!! The words “Molto bene” just wouldn’t come out, until Gianluca said you need to speak in Italian “Va bene”? As she was speaking to both of them, we found out later it was being filmed, as you probably already saw in her post. As security was about to have her move on, Piero said wait, grabbed her hand and told the MC that she was from America, so he came to her with the microphone and asked her what her name was and where she was from and also gave her a big hug!! What an special moment! Now it was my turn. I went up the first two steps and Ignazio was the first to see me and he wrapped his arms around me and gave me a big warm hug… I was flabbergasted almost at a loss for words… but this is mighty mouth Jeannette and I recovered my vocabulary quickly and asked him if they would sign my book… He took the book and smiled as he looked at some of the pictures and then signed on the front page. The long instore tour is over. It was really long and crossed all of Italy from north to south. The official Facebook page has published this beautiful picture of the guys with this beautiful dedication. I think it was a very tiring period for Piero, Ignazio and Gianluca, all people want to hug you, kiss you, take pictures of you, everyone wants to exchange a few words, everyone wants your attention …….. but you guys, you have been unsurpassable, you have had a smile for everyone, a sweet words for the weakest, hugs for everyone, because you are like that, without filters, just as you appear, humble and generous guys. Beautiful photos, but surely the video that follows, is my favorite, it was done without our guys knowing about this. This video shows exactly the great hearts of Ignazio, Piero and Gianluca towards this disabled child. And who wouldn’t want special hugs like that? OK, guys, the tour instore is over, you have dispensed so many smiles, so much joy, so much affection towards your fans, that, if possible, they love you even more. These days, the boys are facing the commitments of the instore. We get many photos, but some certainly sweeter than others, confirm to us, the sweetness and availability of Ignazio, Gianluca and Piero. How much sweetness in these videos. These guys fill the heart, how can you not appreciate these gestures? And what about this child who did a haircut in honor of IL VOLO? But now I want to talk about another very sweet thing, let’s call it a sweet memory. About a year ago, in May 2018, I told you that IL VOLO had received a nice prize called ARTE E CULTURA. They were in Bagnaia, in Tuscany, and the award was given by Mrs. Marisa Monti Riffeser, here is the picture. Mrs. Monti Riffeser, has held the figure of majority shareholder and president of the group Poligrafici Editoriale, in short, a very important person. During the award ceremony, Piero explained how IL VOLO personally met the lady, by pure chance. She was on an air flight and could not open a bottle of water. Piero who was behind her, saw her in trouble, he offered to help her and opened the bottle, then when she got off the plane, Piero gave her his arm because she could get off the ladder easier. Piero did not know the lady, but instead, she knew very well who those three boys were and so she told to Piero, “Mr. Barone you, besides being a great artist, are a great person”. From that moment a beautiful friendship was born between Mrs. Monti Riffeser and IL VOLO, and this friendship culminated last year with the award ceremony in Bagnaia. The CD was released for sale on February 22nd. Unfortunately, Mrs. Monti Riffeser passed away a few days earlier. Michele Torpedine, Il VOLO, Barbara Vitali, Eliana Dalila Biondi, embrace Andrea, with his sons Sara, Matteo and Bruno. They remember the smile, the passion and the enthusiasm of Signora Marisa Monti Riffeser, grateful to have had the honor of meeting her. A passionate greeting to Mrs. Marisa Monti Riffeser, we will always follow her valuable advice, and we will keep for example her enthusiasm. We add an affectionate hug to Andrea with his sons Sara, Matteo and Bruno. 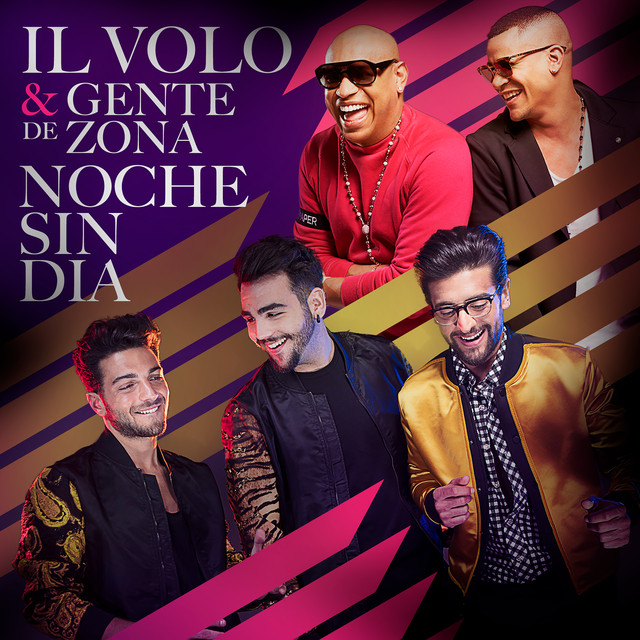 Piero Barone, Ignazio Boschetto, Gianluca Ginoble – IL VOLO. In short, these guys, as well as being good singers, humble and special guys are also very very sweet …. there are no words !! Crew, I do not know which way to start telling my day. I just came back from Milan, where there was the instore for the presentation of the new CD, MUSICA. My feet are broken, and I’m very tired, but I want to fix immediately, the emotions that have marked the day. I had already decided to go to Milan on Friday, but on Thursday, I received a letter from the official fan club, which warned me that I had been drawn, to take part in the mini-live that would take place a couple of hours before the instore. Here I am with, in my hand, my copy of MUSICA, the new CD. What about the Duomo behind me? Always beautiful to see! After a couple of hours they call us for the mini-live. After going through the check of documents, here we are all lined up in the corridor, waiting. We will spend more than an hour in the corridor, with an incredible heat, because it was a beautiful spring day. Meanwhile, we fans talk, and who should I see but Veronica. She bought tickets for Jana, for the Verona Arena. Veronica sends you her greetings, Jana !! And finally they let us in and tell us to sit on the ground ….. is not the best of the comfort, but they explain that they can stand up only at the bottom, otherwise nobody can see before. We are 150 people admitted to the mini live. The director of Radio Subasio comes and begins to present the event. He says that during the week in Sanremo he was able to know Ignazio, Piero and Gianluca well and he says they are really special people (we already knew that) and he says that Radio Subasio will always play the music of IL VOLO. But now here they are ……. 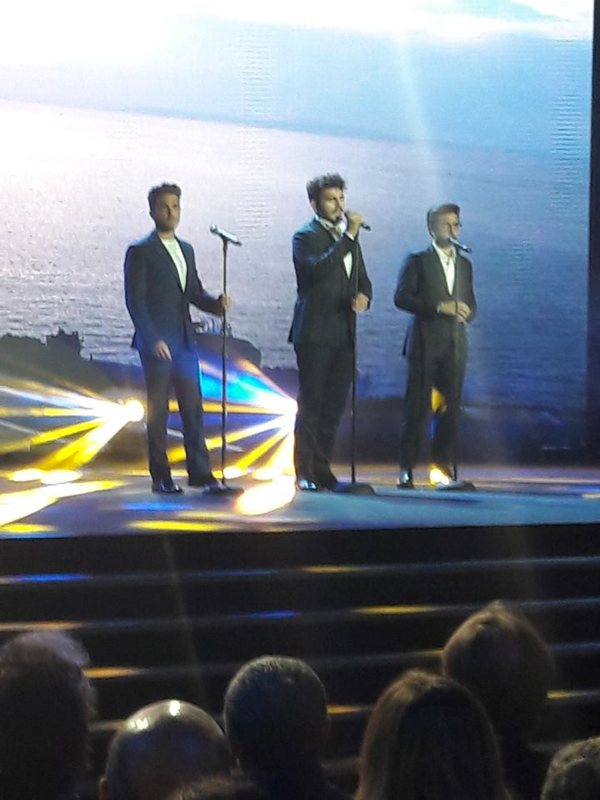 IL VOLO….. Ignazio, Piero and Gianluca !!! Did you manage to see me in the video? They are really beautiful and funny, they sing and we all sing with them. This is a video of mine and of course what you hear is my voice!! And here’s another video, of the same time, we were all singing. There was a very relaxed atmosphere. My legs hurt so much to stay in that position, but it did not matter!! Gianluca also made a video! RS = In this CD there is music present and also of the past. G = Yes, it is a slightly different album from the others we did in the past, because however there are more contemporary sounds, the choice of songs, also, but without abandoning the classic, such as “Be My Love” sung by Mario Lanza, but also by all the greatest tenors. This represents a new beginning, a new path, which will lead us to have “a new face”, we sing with what are our true voices, our musical styles, which are different. It represents us 100%. RS = Are you a little more pop, compared to the past, is it true Piero? P = We have undertaken this collaboration with Michele Canova, we are fans of Mengoni, Tiziano Ferro, Jovanotti, and Canova has produced all the albums of these great artists and we have decided to collaborate with him and I must tell you that we are very satisfied and surprised of the work he did. RS = Well, Ignazio, in the meantime, congratulations. Congratulations because of you, this week, there was the image of you give a caress on the cheek to Mahmood (applause). A gesture of great class, “chapeau” to Il Volo but above all to Ignazio, because this is the thing that remains of this Sanremo, as you have accepted this result. RS = Proving that it is absolutely not true that they did not like the result, and that they are envious …. the envious one is another (Ultimo). RS = So, you won the festival 4 years ago, in 2015, this year you came back, because you had to celebrate 10 years of IL VOLO activity, and you showed that, despite having won a Sanremo, and after having participated as super-guests, you are back in the race. It’s nice to be able to live Sanremo and sing for four nights in a row, even for you who have followed us, and voted. RS = Yes, voted, because IL VOLO on Friday evening are splashed at the televoting. What did I tell you? Televoting !! P = Now, girls, we know that in Sanremo you have voted so much, now give your banking code to Ignazio, who will think about making the wire transfers to you. RS = It is nice to feel the warmth and the affection of your audience, now they have bought the cd and then they will come to see you on tour in concert. P = One important thing, I read that you ask for dates in Sicily, in other places ….. in a few days, we will publish many other dates, now we have announced 7/8, there will be many. I = It will be a summer tour. I = It will be a summer tour and then there will be other surprises, indoors (indoor concerts). RS = Let’s say that they are back in Italy and do not leave us, they want to be heard and sing live. We listen to another song, because we have to get ready for the tour, for the concerts, from today the new album is out, we need to learn the new songs, like “VICINISSIMO”. G = “A CHI MI DICE” because they already know it. I = Let’s say to “A CHI MI DICE” and then we end up with “VICINISSIMO”. RS = “A CHI MI DICE” in the version of IL VOLO is the track number 4. This song was brought to success by the BLUE and was written by Tiziano Ferro. Now begins “A CHI MI DICE”, sung by all the fans. ….. and this below is my video. After the song, the director of Radio Subasio, asks if there are any questions, no one raises his hand. Only a 10 year old girl, name’s Chiara, close to me, asks to speak. Chiara tells the boys, that they are very beautiful and that she feels Gianluca as a brother!! The boys are very relaxed, Gianluca is the most elegant, with light trousers and gray jacket, Piero has a grey turtleneck sweater and black trousers but wearing fluorescent yellow sneakers, very showy, and at some point asks the fans if his shoes are beautiful. Ignazio wears a flannel trousers and a simple mustard-colored sweater, he looks a lot thinner in person and all three are really young, young men. The director of Radio Subasio, still asks if anyone wants to ask questions. A boy takes courage and says that he follows IL VOLO since they won Sanremo and he likes them a lot. A woman says they are very good and would like their greetings, for her 86-year-old mother. Another boy says that thanks to IL VOLO he has established many true friendships. In short, no real question, and then I make a sign, I have a question, or rather two. They give me the microphone and they tell me to stand up. My legs are numb for the position on my knees, but I get up, too bad that there is no video of my intervention …. Me = I’m Daniela and I’m from Brescia. First of all, congratulations for Sanremo, you were really great. In the fourth evening, that of the duets, you did a wonderful duet with Alessandro Quarta, do you think that, in any of your concerts, we will see the participation of Alessandro Quarta? G = We cannot say anything but there is the idea. P = It’s possible, let’s see. I = First of all we must say that with Alessandro we have a good friendship and then everything is possible. Me = I have another question, the American fans . . . I have been advised to tell you that when you go to do concerts in the USA, they would like a less classic program, because at the end of the concert they would like to stand up and sing and dance like Italian fans. G = Now our program will be this, it is no longer Notte Magica. I = Of course, the program that we will bring will be that of the CD …..
Me = … yes, but when you talk of concert on American soil you say you will do a more classic program. I = ….. but if you let me finish (everyone laughs), I was saying that before we were bound by Notte Magica, but now we’ll bring more pop there too. I must say that I was not at all troubled to talk on the microphone and in front of everyone, in fact, I felt in the family. I took the opportunity to talk about the American concerts, because then during the signature-copies, they stop for a few minutes. After the series of questions, ended with my speech, they asked to pose for the final group photo and then we had to get out and queue for signature-copies. These are the last shots I took before going down. There were fans waiting to sign-copies, so we had to get off. In a short time it became dark. We who were at mini-live had precedence, so we all started waiting for our turn. We were on the second floor, for the mini-live, about two hours of which one of waiting and one of mini-live. I arrived in Milan by train, accompanied by my husband, but he was not admitted to the mini-live, so he had to wait outside …. what a treasure! When I got out, he said the voices were heard downstairs, so he figured out that I was talking at the microphone. And here are some photos, while we are in the queue and we approach the boys. Finally our turn has arrived, and here is our official photo – me and Beppe and IL VOLO. I was able to make a few words with the boys to whom I brought your greetings, they signed the CD and also the book UN’AVVENTURA STRORDINARIA that I had brought with me. I gave two kisses to each of them. A few moments and it was all over. Outside the library, there were Torpedine and Barbara Vitali sitting outside a bar talking to a couple of friends. I wanted to stop and talk to them, but I did not want to be inappropriate. And so we headed to the train station, about 3 km to do on foot, as we had already done on arrival, under a hot sun. We arrived at the station, everywhere there were great videos that projected the event of IL VOLO. Finally on the return train, I was able to rethink that frantic afternoon. I was finally holding my new CD and I was so close to the boys. They are really simple and genuine. I hope this CD will lead to their sales success, which is really deserved. JUST FYI!! I just tried to order tickets (Feb 16 at 12p) and either the site is jammed, or blocked, not sure what, but I can’t get past the “go to shipping” info area. 😦 My dear friend Veronica said she would try to order me some from there. Hope there are still tickets left when she gets home! Good luck if you try to order any!! You will need to register on the site first and sign in. It actually still had my order from when I purchased them almost 3 years ago now! Lol! Here, the first dates of the Italian tour have been announced. Finally the tour is taking shape. I think they are only the first dates, surely others will be added, in fact you will have noticed that there is no Taormina and this is not possible. Also there are not the two dates of Matera, which we know well have been announced. Maybe those are the two dates of the PBS special, will they be by invitation only ??? I believe that I will go to Verona, but I still want to wait for the announcement of all the dates. The dates of the instore have also been announced. I will go to Milan on 22 February, only a few days are left, what a thrill!! I will be able to see them, even if only for a moment, while they sign my copy of the new CD. For now, this is the news, but it’s just the beginning . . . things are moving. Soon other dates will be given. Some good news was needed, given the latest news that had made us so angry, and things, here in Italy, are not yet settled. On the contrary, every day we discover many wrong behaviors, ungenerous and unjust actions that our guys have suffered for years from the press. Things do not end here ….. there will still be a lot to say. It was announced the boys would be present Sunday, November 18 at an instore in Florence, at Mondo Camerette. Only 100 people were allowed to take pictures and receive autographs. Unfortunately I had a lunch with friends that I could not postpone and so I could not book, but there was a direct video very nice that now I translate. After the pleasantries, asks the audience to call loudly IL VOLO, the boys arrive). I = Rightly, they put the lower microphones because we remain bent. Presenter = Why did you take all this time to get here? I = Because Gianluca was fixing the tuft (his hair). Presenter = OK, but let’s get to know them a little better, of course, who does not know these fantastic guys, but let’s go a little bit in the specific ok? I followed you a bit before, we met and I know that you are so attached to the family, as it should be, especially because you spend about 11 months a year, away from home. The question to guys like you, why is distance so difficult to bear? I = Precisely because it is far away, and therefore it is difficult to manage the distance from anything, especially when you are far from the affections. We are three guys attached to our families, also because we grew up traveling with them, we were minors, now we can travel alone, you know, but I think the family is a fundamental thing. P = Above all now, while we went down there were the children’s bedrooms, Ignazio wants to make a baby, so …. I = If there is any volunteer …..
Presenter = Yes, there is, do not ask this question …. P = There was the lady waiting for Ignazio …. love has no age. Presenter = What do you want to say, in fact, what do we want to say to the younger guys? You have made many sacrifices and even riding a world fame, because they were the first Italian group of worldwide fame to bring Italy into the world with a new style that is lyric pop. P = Surely nowadays we try to follow fashion, only that, in life, we must have personality, which is what makes you distinguished from everything and everyone. Today, whatever you like to do, carry on your idea, your thinking. There will be thousands of prejudices, people who will come against you, but if you are different from others, that is, if you have personality, you will have success and great satisfaction. Presenter = I say they deserve a nice applause! Presenter = I value you so much. I value you so much for this concept that you give. You are guys who have grown so much, fame speaks for you, I wanted to remind all the boys here that the sacrifices …. P = The kiss was for me. I = (to the presenter) I did not want to interrupt your speech, I’m sorry but … professional deformation! Presenter = All right. That said, I know that soon, you’ll be in concert in northeastern Europe for the first time? I = Some countries will be the first time, for example, Hungary, Croatia, Slovenia, Slovakia, virtually all. I = I joke, we have been other times but never in concert and it will be nice because it will be the first time with that audience in concert. Presenter = How you will cope with the cold of Poland, given that today’s already seems a lot. P = We were, this week in Budapest, in Zagreb and I have to tell you that there are some people who have welcomed us well, very well. But will any of you come to Budapest or Zagreb? Then we’ll see you there. P = Are you from Naro? Yes? (turns to Torpedine) Michele, they are from Naro. I = Boys, I think that Naro is “Caput Mundi” because everyone is from Naro, it’s the people. Presenter = Attention, he is stripping live, I remind you that you are live. I = But no, I’m getting dressed, it’s cold. Presenter = It seems very JUVE that shirt, a clap at the striptease done live. First you told me about a book. Presenter = Yes, it is written by Torpedine, which we remember is the manager of these fantastic guys, and also of other great artists. I = As we have finished his money, we make him promotion: buy Torpedo’s book. Presenter = We arrived at the moment of the photos, do you still want to say something? I = As always it’s nice to see you here, because lately we are very focused on the projects that will see light in 2019, so we are working, and therefore we have not had occasion to see each other and it’s always nice to meet you, thanks for coming and now we do the photos. Presenter = Perfect, we have arrived at the best point, so be prepared that we start taking pictures and autographs. I = Wait, we go down. P = Does the lady want to say something to the microphone? Woman = If I can? Presenter = Of course you can. I = Lady tell me, the question. Donna = I saw you in Sanremo with Carlo Conti, I never look at Sanremo, but when I saw you, I fell in love, because you are simple, as well as good as singers. I = Did you fall in love with Carlo or us? May God bless you, and your families. Start the photos and autographs. But before leaving a last autograph, but this time directly on a door of a bedroom. Ok guys, you were good and funny, but you’ve also been so cold. In addition, Gianluca has never spoken, because a friend of mine who was present at the event said he had some kind of fever. Be careful, take care of yourself, the concerts will begin soon.